When life gives you lemons, you make electricity. The automotive industry’s ‘green revolution’ hopes to make electric vehicles far more efficient. Every bit of force under the hood should be used to its maximum potential. That why you have concepts such as regenerative braking, which return some of the energy used in braking back into the system. But Audi is looking at tapping another roadway staple: potholes. It has created a system called eROT, an active suspension system that stores the energy when a driver hit potholes, bumps, and other forces that induce kinetic energy on a car. The eROT system was created by replacing hydraulic shocks with electromechanical ones. The electromechanical rotary dampers in the 48-volt electrical system allow the car to use this kinetic energy. This is all accomplished by having a lever arm absorbing the motion of the wheel carrier, which is then transmitted to an electric motor via a series of gears. The electric motor then transforms this into electricity. On average, this system is able to pump out 100 to 150 watts. That varies depending on road condition. For example, a newly paved highway will generate as little as 3 watts, and a rough country road as much as 613 watts. According to Audi, this would translate to CO² savings of up to three grams per kilometer (4.8 g/mi). But this system doesn’t just store energy from potholes. eROT also makes your drive better. 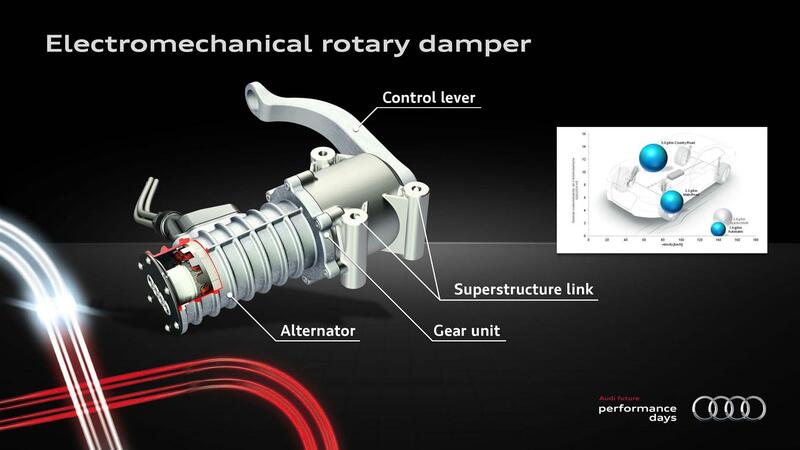 The system allows the dampers to adapt to the road conditions and the driver’s driving style. These new dampers also free up space in the lugage compartment. Drive better, and enjoy the potholes along the way. Seems like a pretty good deal.